The lowest level is the patio level. Living suites on this level open out onto the swimming pool. 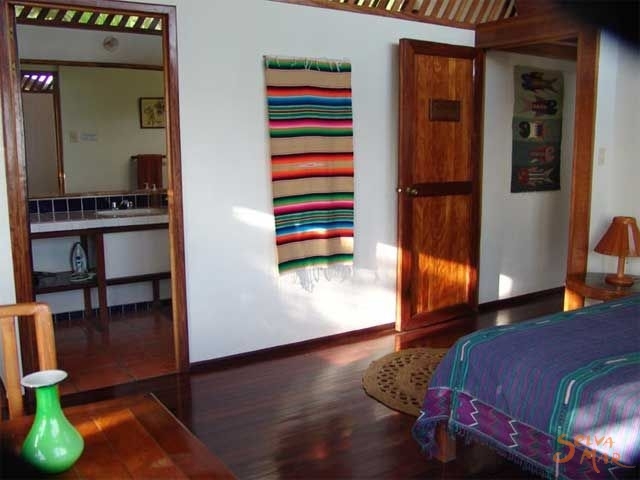 The patio level contains two suites, The La Terraza Suite and the Master Suite. 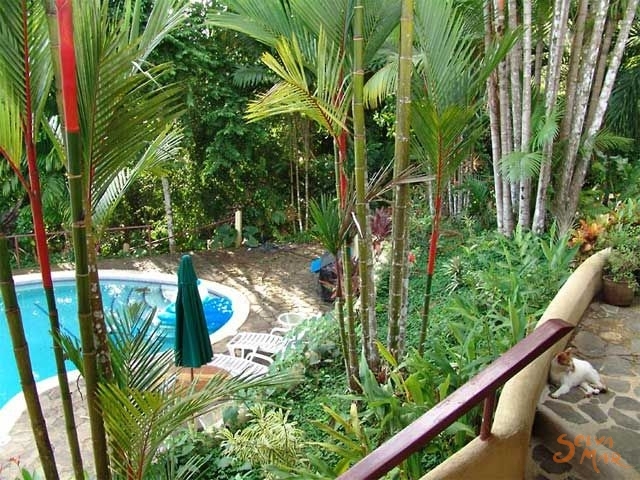 * La Terraza opens directly onto the pool patio. 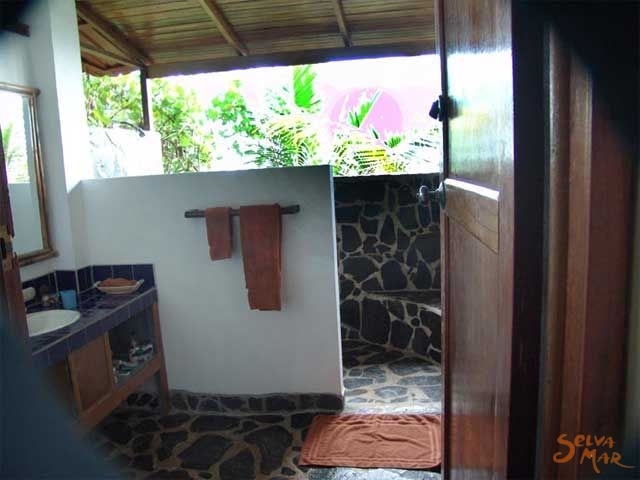 La Terraza includes a large sleeping room with a full ocean view and an attached full bath. 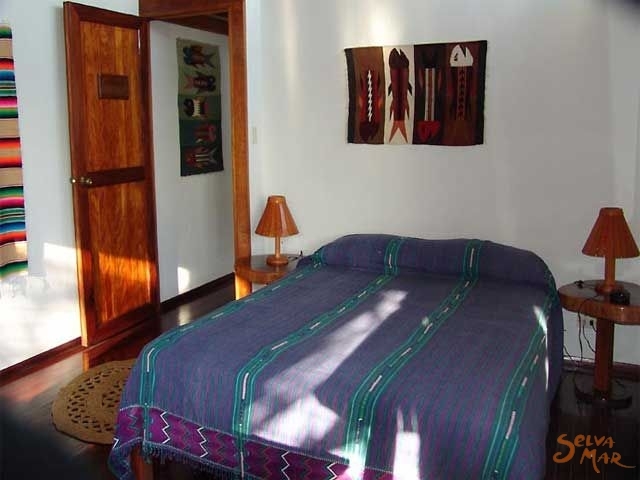 The sleeping room contains a small closet area and is furnished with a table and chairs in addition to the queen-sized bed and night stands. A ceiling fan over the bed complements the natural ventilation of the room. The Master Suite contains a sitting room with a full closet area, a sunken sleeping area with two seating areas adjacent to the queen-sized bed and night stands (as well as a ceiling fan and overhead light) and a full bath that features an outdoor shower with an ocean view. The Master Suite accesses a lower level veranda with an ocean view and has direct access both to the patio and pool as well as a stairway to the main floor of the house. 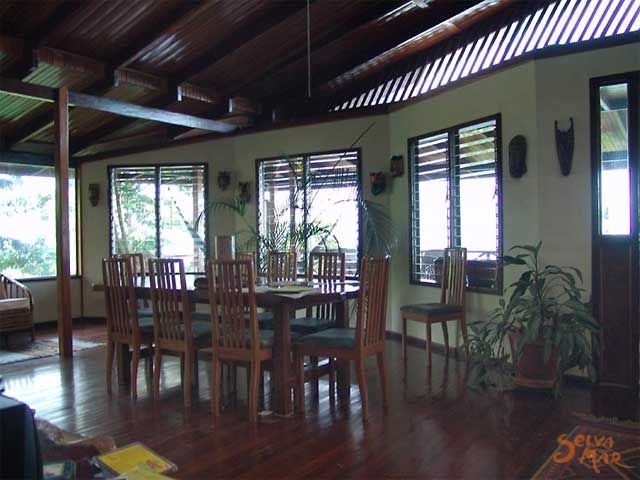 The primary living areas of the Villa are located on the main level. The largest segment of the main level of the house is an approximately 20' wide by 45' long Great Room. 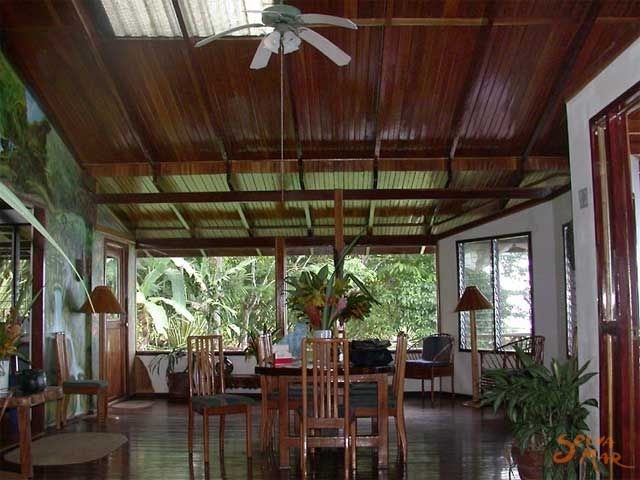 The vaulted ceiling area is finished in exotic hardwood and includes two skylights as well as three ceiling fans for ventilation. The floor is a tropical hardwood called "purple heart." The interior wall of the Great Room is covered by a life-sized mural of jungle scenes. The interior wall of the Great Room, showing the jungle scene mural and large wet bar area. The Great Room includes a large dining area with a table that seats 10-12. There is a small television viewing area with a TV and VCR/DVD player and a large wet bar. A stereo tape and music CD player is also located in the Great Room. Adjacent to the Great Room is a full kitchen with a large refrigerator, gas stove and oven, microwave, dishwasher and a full range of small appliances, tableware and glassware, stored in a full pantry. The kitchen and pantry contain quarry tile floors. * A powder room, laundry room, with full sized washing machine and dryer and an owner's office complete the main floor spaces. On the ocean and pool sides of the main floor, a large, covered veranda provides the best vistas for animal and bird watching, whale watching in the Pacific Ocean or just viewing the pool and patio areas. 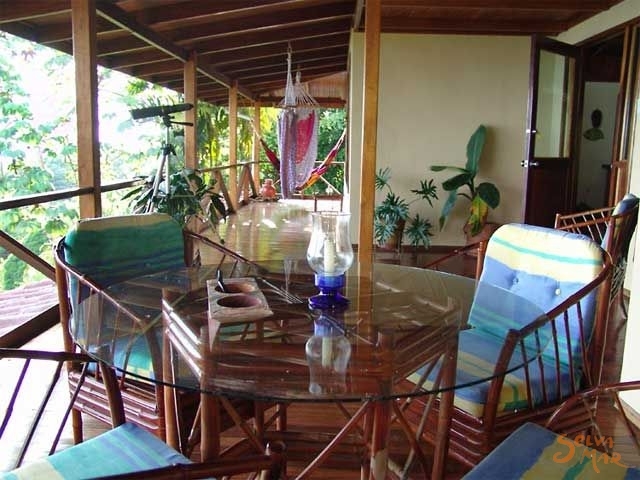 The veranda is furnished with chairs and tables, for eating and lounging, including two hammocks and two hammock-chairs. A spotting telescope is available for long distance viewing. Stairs lead down from the main level to the Master Suite and up from the main level to the bedrooms located in the upper level. ...contains two large sleeping suites, Sunrise and Sunset. 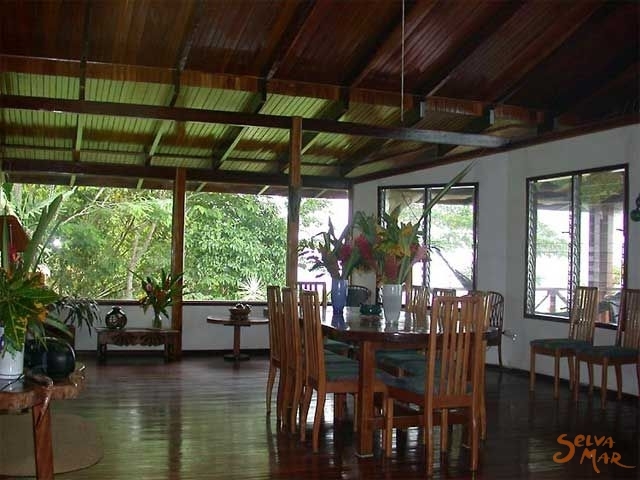 Sunrise and Sunset are both large living suites with vaulted, hardwood ceilings and attached full baths. Each sleeping room contains a small closet area and is furnished with a table and chairs in addition to queen-sized beds and night stands. Ceiling fans over the beds augment natural ventilation. 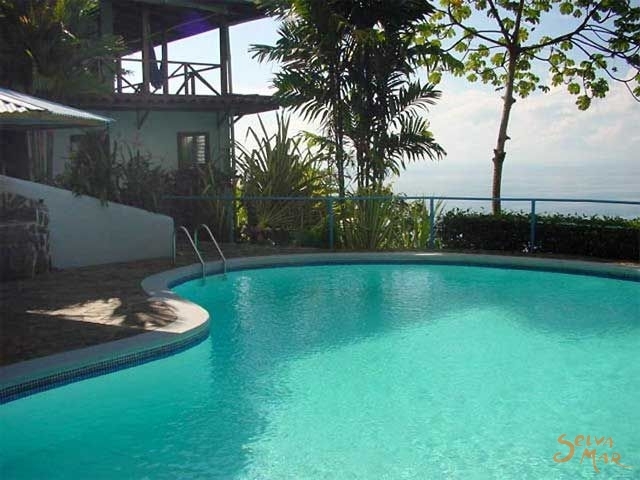 The swimming pool is located on a natural stone patio adjacent to the La Terraza Suite. 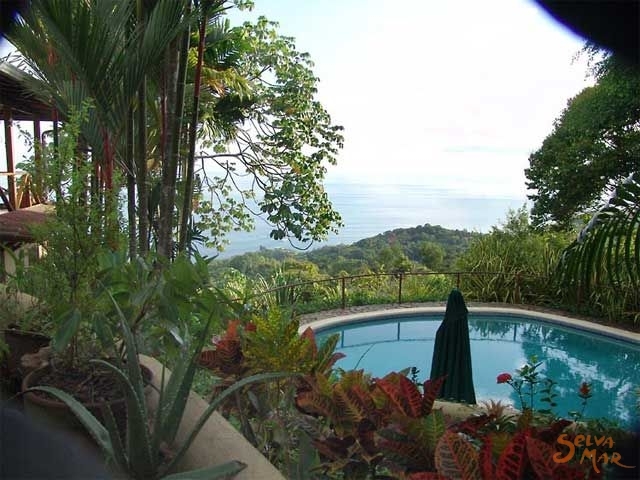 The patio affords a wide view of the Pacific Ocean and is landscaped with native trees and ornamental foliage plants. The pool is kidney-shaped, about 35 feet by 20 feet and is seven feet at the deep end. 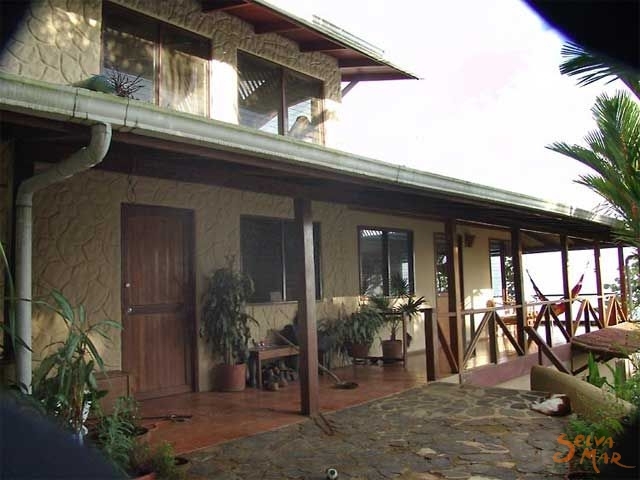 * From downtown San Jose, the easiest driving route to Dominical is via the mountainous Inter-American Highway south to San Isidro de El General and then west to the Pacific Coast. 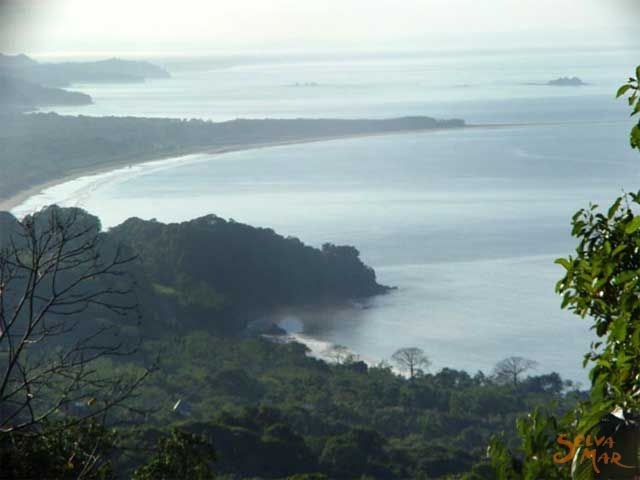 * From the Juan Santamaria International airport, the coast road route via Jaco and Quepos is a good alternative. This drive is several hours long, normally 3-5 depending on the route. It is a beautiful drive and most of the roads are in good condition (see below for exceptions). However, we do strongly recommend you make these drives in the morning when there is plenty of light and little fog in the mountains. 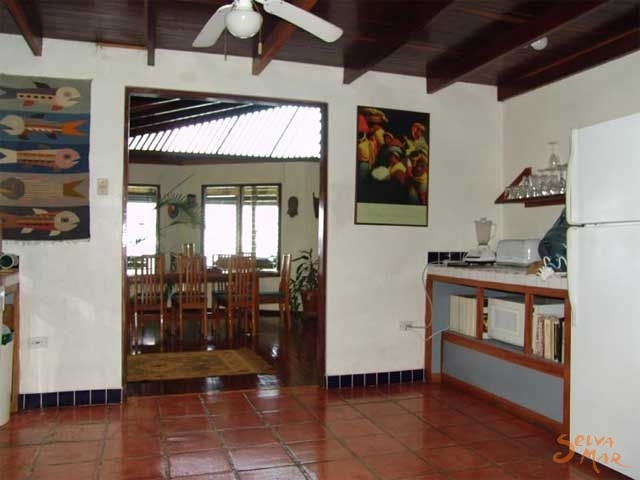 Alternatively, if you wish to avoid a long drive you may consider a Sansa or Nature Air flight from San Jose to either Quepos or Palma Sur, arranging in advance to be met by a car rental agency at the Airport. The drive from either airport to the Villa is about an hour. The flight is about 30 - 45 minutes. DRIVING THE INTER-AMERICAN HIGHWAY ROUTE. Beautiful, unspoiled beach just south of Dominical, Costa RicaThe route is approximately 170 kilometers and takes about 4 hours. It is often rainy and foggy in the afternoons, so it is best to start your journey from San Jose in the morning. You will then pass through pastureland dotted with pinewoods and the Centro Industrial-Cartago. After a few miles you begin to climb into the mountains. 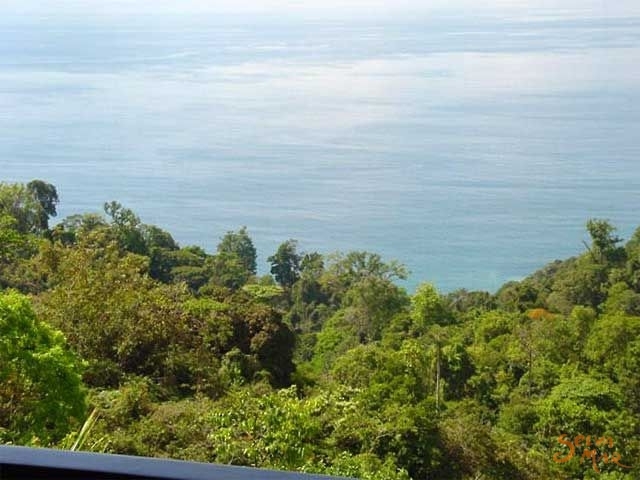 The climate, flora and fauna are diverse and the views stunning. The highway climbs to an altitude of nearly 12,000 feet, before descending into the town of San Isidro de El General (about 3 hours). As you enter San Isidro de El General, watch for the sign for the road to Dominical (A McDonald’s fast food restaurant is located on the corner). San Isidro de El General - Dominical. The paved road becomes a beautiful rural road that winds up through the coastal mountain range and then down toward the Pacific Ocean and Dominical (about 1 hour). View of Pacific Ocean from the road above DomincalThe coast highway. The San Isidro road ends at the Costañera Sur or coast highway. At that intersection, check the reading on your odometer and turn left (south), onto the coast highway. 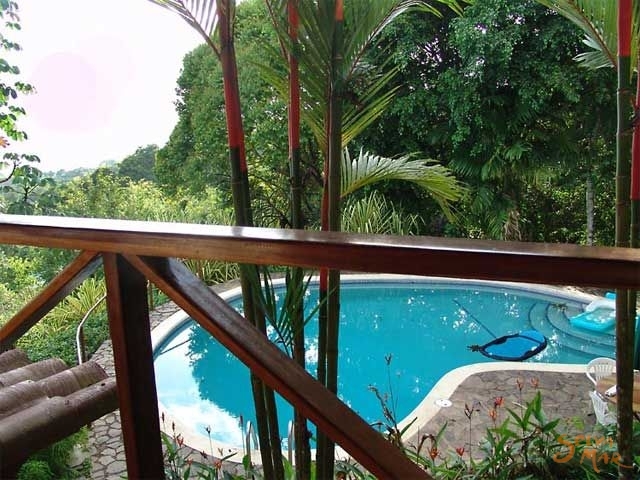 You will immediately cross a concrete bridge over the Rio Baru, continuing past the side road to Dominical (about .4 kilometers on the right), then the Plaza Pacifica shopping center (on the left). The Costanera is marked with distance signs every kilometer. After kilometer marker 151, the road curves gradually to the right. Midway through the curve, the roadway begins a gentle rise. At the top of the rise, where the curve ends, you will see a bus shelter labeled “San Martin Sur” on the left of the road. Turn left just past the bus shelter and proceed up the San Martin Road for the final 2 kilometers to the Villa. At this point you need to engage your 4-wheel drive (low gear). After approximately 2 kilometers, the San Martin Road reaches a crossroads. Follow the “Villa Escaleras” sign and turn right at the crossroads and continue about ½ a kilometer to the Villa (driveway intersects from right).